Our family-run hostel aims to provide our guests with the highest quality accommodation, tour and travel-booking service in the Whitsundays. Bush Village are the only hands-on family-owned and operated budget cabins in the region. New Owners Judy Elliott and Bryan O'Sullivan take pride in offering you the best accommodation, along with local honesty and reliability. We proudly cater to families, older guests, tourists and backpackers. We cater for up to 68 guests across 18 double, twin or family-sized cabins for 4-5 people, including kitchen, linen and en suite amenities with a large range of styles to suit all budgets. All of our cabins are clean, quiet and secure. Our facilities include a swimming pool, spa, BBQ, WiFi internet connection, TV, laundry, a bar, secure off-street parking and a quiet garden with hammocks. We also offer a full Whitsundays tour-booking service. In our communal area, guests can cook together. We're close to Abel Point Marina, where most of the overnight and day trip sailboats depart from. The local Coles Supermarket, post office and shopping complex are only a five-minute walk from our door. The local bus picks up and drops off right at our front door. If you are arriving by Greyhound or Premier buses, please let us know so we can give directions. The choice is so easy - you can party up in town where it is loud, and when you want to sleep you can be assured of a quality, clean and quiet room to come home to. 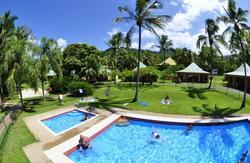 The distance to Airlie Beach town is 1.4 kilometres - a pleasant walk along the beach and Marina Boardwalk to town. Lonely Planet rated Bush Village as 'Top Notch Accommodation'! Whatever form of accommodation you choose, our Family invites you to become part of our extended family whilst enjoying your holidays in the magnificent Whitsundays. If driving into town, Bush Village Budget Cabins is located just off the main road, Shute Harbour Road, which leads into Airlie Beach. We are located in Cannonvale and are just past the Whitsunday Shopping Centre on your right-hand side. Our signage is located in the front of an old Queensland House (directly after Club Crocodile) and at this point you turn right into St. Martins Road which simply leads into our premises. If arriving by aircraft there is a shuttle bus transfer to and from Prosperine or Ferry to Hamilton Island airports: the local bus stops in front of our property on the main highway if you wish to travel into Proserpine for a day's outing. We are 1.4 kilometres out of the hub of Airlie Beach. If arriving by Greyhound or Premier bus, call us between between 8am and 7pm and we will advise you how to get here. For late arrivals, phone us beforehand and prior arrangements can be made for a key to be made available upon arrival.